On June 13, 2014, with the northeasterly trade winds already rustling the D.T. Fleming Beach palms, and a parade of well-wishers funneling down from the nearby Ritz Carlton resort, Hawaiian Paddle Sports owner Tim Lara was holding ti leaves between his toes. As part of the blessing for Ka Manu o Honolua—Hawaiian Paddle Sports’ newest canoe—Lara was making a ti leaf lei that would be used as part of the ceremony. 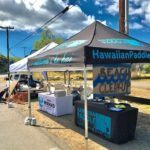 Though it wasn’t even an official part of the morning’s planned activities, it was a small gesture to how Hawaiian tradition plays a role in the company’s credo. Traditionally leis would be made—not bought—when blessing a new canoe, and down to even the smallest details it would be the same today. Along the shoreline, a small group of about 30 attendees gathered around the canoe, which had just arrived the day before and had yet to touch the sea. Also in attendance was Clifford Na‘eole, the Cultural Advisor for the Ritz Carlton Kapalua and the master of the morning’s ceremony. As the blessing attendees gathered to begin, the ti leaf lei was draped across the canoe along with a ko‘i (stone adze) and koa wood bowl. 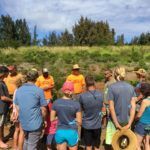 With Lara offering three blows of the pu (conch shell)—the sound echoing off of the salt-bleached rocks of sacred Makaluapuna Point—Na‘eole explained the connection of canoes with Hawaii’s nature and culture. 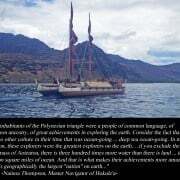 “For Polynesians,” he began, “the currents were our freeways, the stars were our stoplights, and the wind was our gasoline.” This canoe, it was explained, is no different than the traditional canoes used by early native Hawaiians, and to bless it here on the sands of Honokahua is a momentous and important occasion. 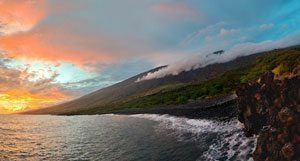 The full name of the canoe—Ka Manu o Honolua—can roughly be translated as “the bird of Honolua,” the neighboring bay that Hawaiian Paddle Sports visits during our canoe tours in Maui. It’s also the bay from which Hokule’a, the traditionally constructed Polynesian voyaging canoe, set sail for its voyage to Tahiti. Also present was Hawaiian Paddle Sports’ sister canoe—Ka Manu o Honokahua—which is named for sandy Honokahua Bay where the blessing took place that morning. Splashing water from the koa wood bowl onto the exterior of the new canoe, Na‘eole explained how the canoe’s wood, and the water used to bless it, are all aspects of living nature being manifested in other forms. “The canoe,” he explains, “is a living entity,” as it uses parts of nature found on land to navigate upon the sea. Grabbing the ti leaf lei from the bow, and reaching for the traditional stone adze, Na‘eole summoned Lara to hold the lei taught over a lightly-colored block of wood. 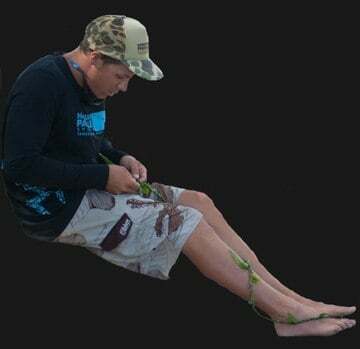 Then, in a moment that passed just as swiftly as a gust of easterly breeze, Na‘eole used the adze to cut the lei in half and signify the birth of the canoe (much like when the umbilical cord is cut it signifies the birth of a child). Five minutes later, as flashbulbs snapped, hugs were exchanged, and waves gently lapped on the sand, Lara invited all in attendance to take the canoe for its inaugural voyage. Both canoes were readied on the sand, and with the collective strength of 30 sets of hands, the canoe was gently lifted from the beach and carried towards the water’s edge. Entering the water through the rolling shorebreak, and with guests piling in to the forward 5 seats, Lara gave the canoe the final push towards the blue of the Pailolo Channel. Cutting across the rolling blue seas towards neighboring Honolua Bay, this new canoe, Ka Manu o Honolua, looked like it had finally found its old home. Have you ever been on a canoe tour in Maui, or experienced a traditional blessing? Tell us about it in the comments below as we’d love to share in your experience. Mahalo to One Moment in Time Photography for providing photos of the blessing!